Several counties in major city metropolitan regions of the United States have become corridors for Indian restaurants and Indian food lovers over the years. Thanks to the growing Indian community in the USA! Loudoun County in the US state of Virginia is home to over 30,000 Indian Americans and a good number of Indian restaurants. Adding to the thriving scene of Indian dining in Loudoun County, VA is an upcoming South Indian food hub named Agni. Why another Indian restaurant in Loudoun County, Virginia? How will it stand out in the competition? Niranjan Sathindran and Srividhya Ganesan, an Indian American couple from Sterling in Loudoun County, have a story to tell about their passion for food and what made them get into the restaurant business without any prior experience. We at Indian Eagle are happy sharing their story. Both Niranjan Sathindran and Srividhya Ganesan have been living in the US for 13 years and pursuing careers in software. The idea of serving south Indian cuisines in Loudoun County was seeded into Srividhya Ganesan’s mind when she was disappointed on finding no food of authentic flavors from South India where she belongs to. She decided to serve homemade south Indian food from a driveway. Opening a restaurant in Sterling was a far talk, then. But, selling food from a driveway is not as easy in the USA as in India. Before they could start the driveway food service, they learned that Loudoun County has more rigorous business permit requirements than those in Chennai, their native city. Besides, it required them to obtain food safety certification in Loudoun County, VA. Srividhya decided to open a restaurant instead of driveway food service while going through the process. Driven by the challenges, they greeted their teeth to make the dream come true. They studied the dynamics of restaurant business, researched the hospitality industry, completed paperwork and obtained necessary permits. Thus they laid the foundation brick of their ‘dream’ Indian restaurant in Loudoun County, VA. They have leased a space of 2600 square feet at 22149 Davis Drive in Sterling for five years from the owner of Sterling Oaks Commerce Center. Davis Drive is a developing industrial zone in Sterling, Loudon County. Scheduled for inauguration this summer, the upcoming restaurant Agni in Sterling will accommodate 60 guests in the dining hall and 10 people in the bar at a time. Agni will have a menu of meticulously selected dishes from the diverse cuisines of four south Indian states: Tamil Nadu, Andhra Pradesh, Kerala and Karnataka. About 95% gluten free food will be served at the restaurant, according to Srividhya Ganesan. Dosa being unique to the south Indian food culture will be on the menu. Rice, a staple food for South Indians worldwide, will be served in different flavors. Agni will stand out among the Indian restaurants in Loudoun County, on the strength of Srividhya’s traditionally inherited recipes from the family cookbook. Some of the wines on the cocktail menu to be served at the bar will be imported from France. “There are south Indian restaurants in Loudoun County. But most of them do typically serve food with extremely spicy flavors which only South Indians and foodies of South Indian origin are accustomed to. Some others end up serving north Indian food to avoid making loss,” said Niranjan Sathindran. “In Loudoun County, many people are under the impression that Indian food means butter chicken, naan, kulcha, dosa, chicken tikka masala and other north Indian dishes,” Niranjan added. The Indian American couple confirmed that though Agni Restaurant and Bar in Sterling will remain loyal to the south Indian food culture it would serve less spicy food to the palates of wider audiences from various Indian communities. 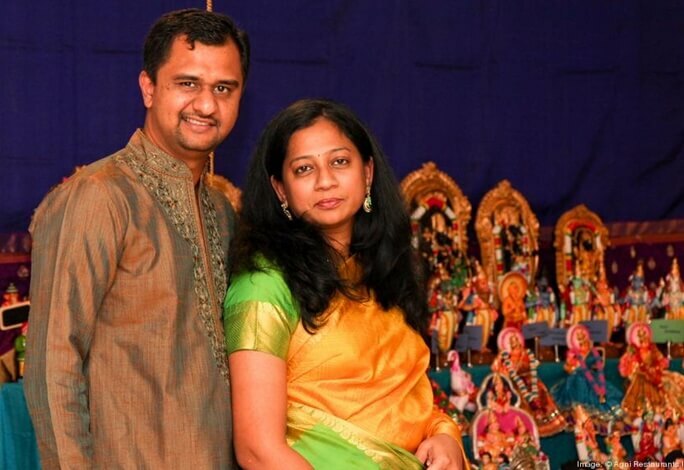 Niranjan Sathindran and Srividhya Ganesan have invested about $250,000 so far from their combined savings. They are looking to meet with Loudoun County’s planning commission for approval. If things go as expected, Agni Restaurant and Bar will open its door in June 2018. Travel Beats is a leading Indian American community portal by Indian Eagle, a trusted partner of Indians in USA making their air travel to India cheaper. Subscribe to Travel Beats’ free newsletter for the latest immigration, visa, air travel and community news.